Yep, it’s here at last – July 19, the 39th anniversary of the Sandinistas entering Managua in 1979, marking the true fall of the Somoza regime, and the probable reason for the recent escalation in government violence in Nicaragua. President Ortega and Vice-President Murillo wanted things spick and span and bright and clean for the birthday party. I suppose they figured if they kill everyone before today, the only people left will be their supporters and we can pretend it’s all peachy and life is normal again. FSLN really had a seamless transition from ruling party to paramilitary death cult. The only problem is, Ortega and Murillo no longer represent the spirit of Sandino and life will never be normal again while they cling to power. I’m sure Augusto Sandino would never have condoned the slaughter of his own people like we’re witnessing today. Or the naked land grab and pocketing of millions of dollars that was the Grand Canal Project of Nicaragua. Or rigging of elections to remain in power in perpetuity. I could go on. Or so much other stuff. But it’s the murder part that sticks in my craw most of all. I guess I’m weird that way. There are plenty of true Sandinistas who are speaking out against Ortega and his rejection of the original Sandinista cause though. Luis Carrion, a Sandinista commandante, who served as a vice president and a minister during Ortega’s first go-around in the 80s has been speaking to Voz de America this week, declaring that Ortega’s Nicaragua is now ungovernable. Carrion noted that even though Ortega, in his mind, betrayed the fundamental principals of Sandismo years ago, he still could never imagine the depths and limits of cruelty, terrorism, and repression he’s seeing the government perpetrate right now. I guess he’s uninvited to today’s birthday party, then. In the meantime, many in Nicaragua find themselves scared to talk, terrified to speak their minds. I don’t blame them at all. The Ortega-controlled legislative assembly passed laws last week effectively labeling anyone who doesn’t support Ortega a “terrorist”. It’s kind of vague what that means. The official position is those who help build tranques or donate/collect money to help protestors and their families are supporters of terrorism and subject to fifteen to twenty years in prison. But it could also mean even talking about the situation, in person or online. As a result, many on social media are now saying they won’t discuss this at all for their safety and the safety of their families. This is something I understand totally. The United Nations is condemning these new laws, too. This week, a spokesperson for the Office of the United Nations High Commissioner for Human Rights (OHCHR), Rupert Colville, criticized the legislation, citing vague wording and expressing the concern that the laws would target those expressing their right to protest. Colville is spot on. These new laws are all about targeting those expressing their right to protest. That’s the point, to clean things up in time for the birthday party today. The UN Secretary-General chimed in too, this week, at long last. Speaking to journalists on a visit to neighboring Costa Rica, Antonio Gutierrez called for an end to the violence and a reopening of the national dialogue talks. The chances of Ortega and Murillo listening to Gutierrez are about the same as them listening to the OAS appeal for them to set a date for early elections in Nicaragua. Zero chance. So this is the situation we find ourselves in on July 19, 2018, the birthday of the Nicaraguan Revolution. It will be fascinating to see what takes place today. 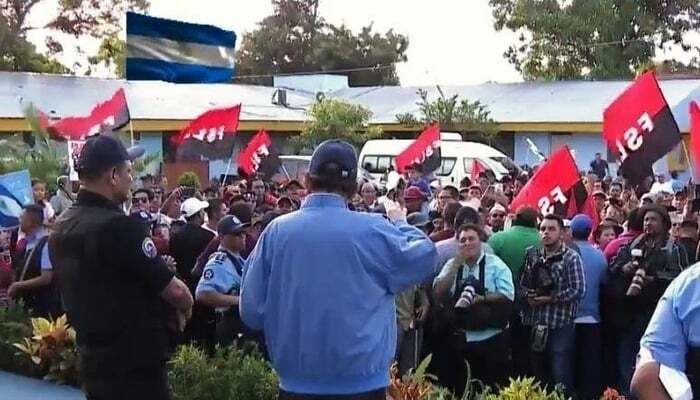 How many fanatics and paid-up government employees will show up at the Plaza de Fe in Managua? I’m sure tomorrow we’ll see doctored photographs of thousands of happy FLSN supporters cheering their beloved Dear Leader. Yuck. Pass me the sick bucket. So happy birthday, Ortega and Murillo’s FSLN. We hope you enjoy it. If there is any justice in this world at all, it will be your last, and a new FSLN, going back to its original principals, will take your place.